Finding a way to install software items that are not "available in your country" is a huge annoyance, especially when it's something like the stock Google android keyboard. Why would this app even be restricted at all? And, why would some phones with the same SIM cards have access to it while others don't? Well, there are a ton of potential reasons. There is the country to which your google account is associated, which could be based on where you originally signed up for the account or the credit card registered. It is possible to change countries but not see an update to your Google Play account. Then there is of course the SIM card's country/network of origin (i.e., MCC and MNC). Another possibility is a firmware-level country code (that is be overridden by a SIM with a different MCC). Finally, there is also your current IP address. Because the old "marker enabler" apps don't work anymore, simply using a VPN to get the IP address of a different country or yanking your SIM card may not actually work to give you installation privilege on a restricted app. Here is a workaround for installing restricted apps on your device. 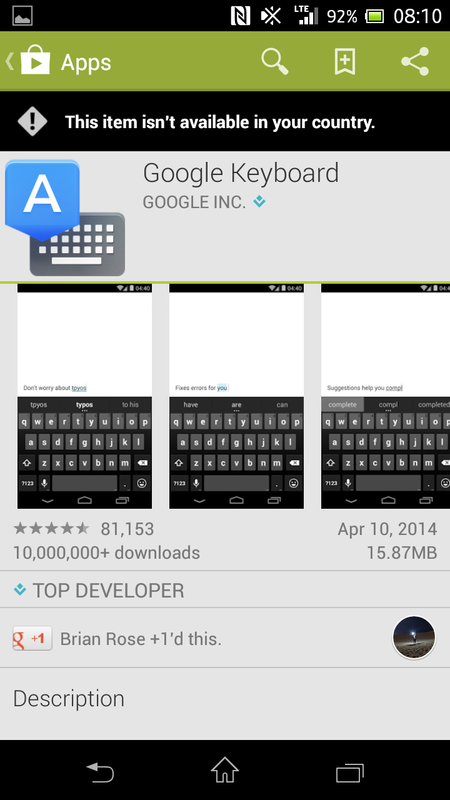 As you can see from the image below, when using the desktop version of the Play store, the Google android keyboard was only installable on my Nexus 7. 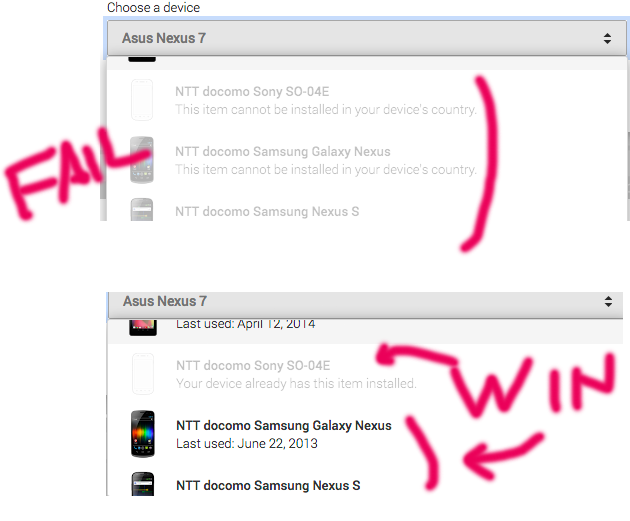 It could not be installed on any other devices, including two Nexus phones (Galaxy Nexus and Nexus S, both of which had last been connected to the Play store with a NTT Docomo Sim Card). Even though it is factory installed on the Nexus 7 (wifi-only version), once I reinstalled it, it became one of "My apps" and I was able to install it on any other device immediately. It should also now show up in the "My apps" section any phone that is associated to my Google account, even ones on which it was previously unavailable. This should work for any app that is not completely removed from the play store in a particular country.